An Indianapolis Mother of the Year was arrested after police found her and her 3-year-old son lying in the middle of the road early Sunday morning. Officers were called to the 2200 block of Rolling Oak Drive, near 21st Street and Girls School Road, just after 3 a.m. Sunday on a report of a person down. They found an unresponsive woman and child lying in the middle of the street, police said. According to the police report, the officer had to raise his voice to wake the woman, who was later identified as Michelle McFall, 24. McFall, who smelled of alcohol and had trouble talking, became confrontational with police, telling the officer, "she was not in the middle of the road and she and her son were fine and were resting," according to the police report. When medics tried to check on the 3-year-old boy, who awoke when his mother began screaming, McFall "staggered to her feet and attempted to lunge for the medics," the report said. McFall's blood-alcohol content registered at 0.225, police said. She told police that she and her son had been visiting her husband, who she separated from a month ago, earlier in the day. Witnesses said McFall became intoxicated and belligerent after her husband received a call from his girlfriend. 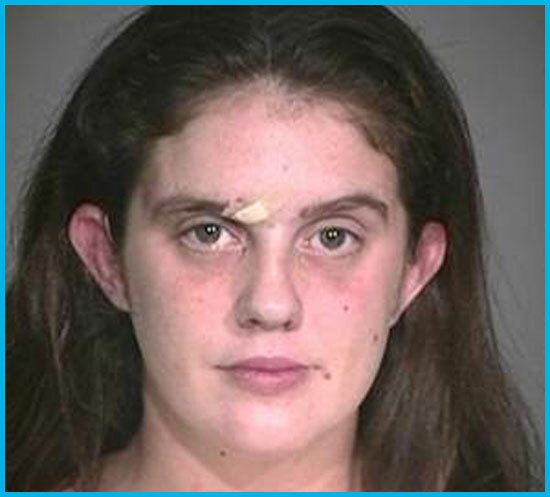 McFall was arrested on preliminary charges of public intoxication and neglect of a dependent. Her 3-year-old son was unharmed. He was taken into custody by the Department of Child Services. McFall McFell on McStreet after a few McBeers? McJail! Sidebar: Her Facebook page speaks volume. Here's a screen grab.